If Byron got one thing right, it was that some Greeks were brave. During the Greek war of independence, many sacrificed their lives for the cause and as a philhellene, Byron too was willing to die in battle for a country that was not his own. Besotted by Greece, in 1818 he had almost reached pop star status for his efforts. Although he was not killed by bullets in battle, but of fever in the marshes, Byron was faithful to the Greeks till the end; as was our very own national hero, Lavrentios. Lavrentios’ house, which still stands in our village, is now a conference centre and museum. It is open to visitors who wish to learn more about the courageous man of whom we are so proud. 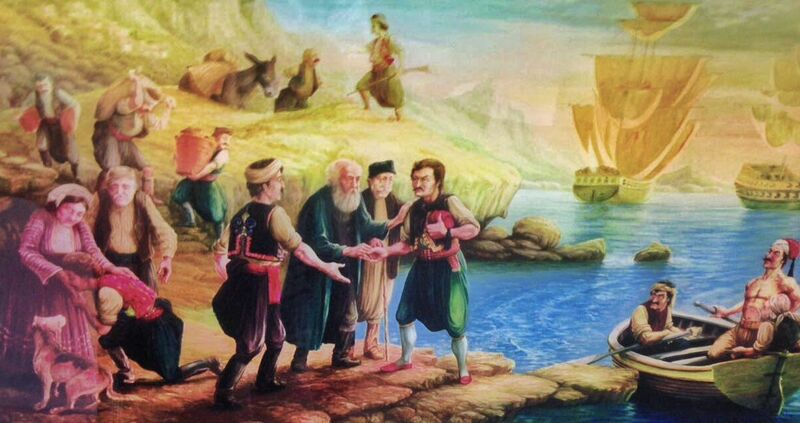 Born in Kalopanayiotis in 1750, Lavrentios entered the world during the difficult years of Ottoman rule. For the first 16 years of his life he focused on his studies, attending school at the Lambadistis monastery, which you can visit today and gaze - as he most likely did - at the beautiful 11th to 15th century frescoes which adorn the church from floor to ceiling. Lavrentios’ life was mostly preoccupied by religion. By the age of 25 he was already ordained as a monk and six years later as Archimandrite. But by 1818, his life took a political turn and he was initiated into a secret organization whose sole purpose was to overthrow Ottoman rule and establish an independent state. Standing on the balcony in the house where he grew up, one can only imagine what thoughts must have gone through his head as he stared out at the beautiful, but occupied land. Three years after being elected Bishop of Kyrenia, Lavrentios was brutally decapitated by the Ottoman Turks in their attempts to prevent a revolution. During those several days of massacres the head of the Cypriot Orthodox Church, Archbishop Kyprianos, was also hanged along with hundreds of other prominent Greek figures. By 1822, sixty-two Greek Cypriot villages and hamlets had entirely disappeared. This month in Kalopanayiotis, we remember our national and local hero Lavrentios, and welcome everyone to join us for a memorial service at Ayia Marina Church on the morning of 9th July followed by a tribute to him in his home and a talk by scholars on the history of the icons and frescoes of Kalopanayiotis. The village choir will also be performing and we have the pleasure of hosting Eleni Papadopoulou on the piano.